I have over 15 years of experience combining data-driven insights with a user-focused philosophy to create successful strategic recommendations designed to increase qualified website traffic. Since the turn of the century, I have built and developed experience in web publishing, technical SEO, content management, and organic inbound marketing strategy. 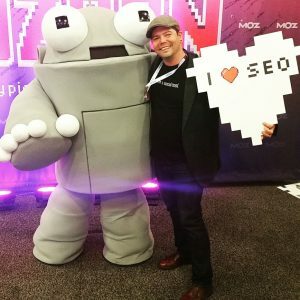 I use this unique mix of skills and expertise to inform strategic Search Engine Optimization programs that provide measurable short and long-term results. During an SEO consultation, I offer you with guidance and expert advice that will help you accomplish your goals in organic search. Learning about the unique needs of your business allows me to develop a strategic SEO plan that is customized to provide qualified traffic from organic search engine results. One of my favorite parts of my job is that it gives me the ability to teach the things that I have learned and practiced over my career. I love to share my depth of experience and passion for SEO by helping coworkers, colleagues, as well as internal teams of developers and engineers. I have partnered with product teams, third-party development shops, CTOs, and DIY designers to build strong, scalable foundations to support a living SEO program.